This article is about pen & ink cityscape sketch of the Chicago skyline #747B, by artist Stephen F. Condren, SAIC, of Condren Galleries, a Fine Arts Gallery, offering JPEG & PDF scans. The delineation of Chicago skyline #747B is short and simple. It is all preparing for the intense amount of hatching and cross-hatching that is to follow. The scene will be at night so most of the images will not be recognizable. My interest in Chicago skyline #747A is more compositional thank formal presentation rendering. In fact this is not any form of architectural rendering for display. 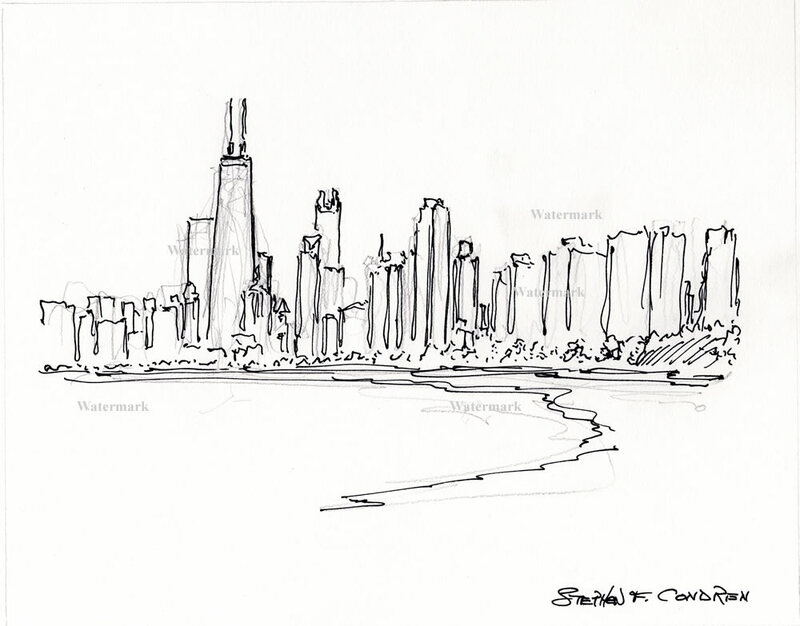 This is a free-hand sketch that is exploring the forms along Lake Shore Drive. You have a mixture of skyscrapers, trees, concrete, and of course water from Lake Michigan. The light is this image is standard afternoon light that show all the froms. However, in the drawing that comes over this it will be in the dead of night. The lighting at the present will do to give us an image of the scene. However, there is nothing theatrical or dramatic in the light of day. The rendering that is to follow will offer a very theatrical vision of North Lake Shore Drive. Chicago skyline #747A is the preamble to #478.